Are you looking for the best web hosting service? Bluehost and SiteGround 2 of the most popular web hosting services available on the market. But which is truly the best choice: Bluehost or SiteGround? Choosing the wrong web hosting provider could hurt your search rankings and business. And that’s why we’ve written an UNBIASED web hosting comparison between Bluehost and SiteGround, so you can decide which one is the best option for your site. Let’s take a look at our head-to-head comparison between Bluehost and SiteGround. Bluehost is one of the largest web hosting providers and is officially recommended by WordPress.org. Started in 2005, they now power over 2 million websites worldwide. They offer a wide variety of hosting options, such as shared hosting, WordPress hosting, eCommerce hosting, VPS hosting, dedicated servers, etc. Bluehost consistently strives for excellence by regularly improving their server hardware infrastructure as well as improving user experience. SiteGround, on the other hand, is one of the few web hosting companies that offers location-specific hosting with 3 data centers operating in the USA, Europe, and Singapore. Just like Bluehost, they’re also an officially recommended web hosting provider by WordPress.org. Their hosting options also run the gamut from basic shared hosting all the way up to a fully-equipped dedicated server. Bluehost uses industry-leading technologies like KVM and OpenStack to make sure your website is as fast as it can get. Whereas SiteGround stands out from the competition by providing the latest speed technologies including NGINX, HTTP/2, PHP7, and free CDN. To test the performance of the hosting servers for our SiteGroud vs. Bluehost comparison, we signed up with both web hosting services and created a test site with WordPress. To mirror the production environment on our test website, we also installed a default WordPress theme, added dummy content, and uploaded some images. According to Pingdom’s website speed test, our Bluehost test site took 689 ms to load for a server in Dallas, Texas. That’s faster than 94% of all tested sites. We conducted the same test on our SiteGround test site. Our test site took only 649 ms to load for a server in Dallas, Texas. That’s faster than 95% of all tested sites. We haven’t experienced downtime during our tests on either of the servers. 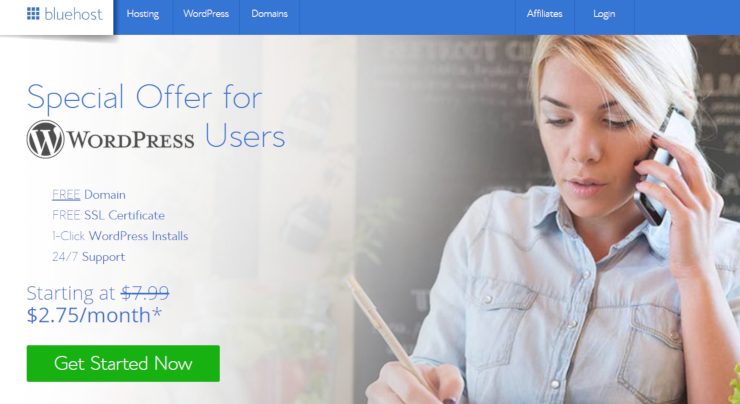 Bluehost offers a great onboarding experience, which makes it extremely easy to kick off a new WordPress website both both beginners and experts alike. On top of that, they’ve also revamped their user dashboard to improve user experience. With every web hosting plan, Bluehost offers a free domain name, free SSL, and 1-click WordPress installs. That means, with Bluehost, you get everything you need to get your website up and running right off the bat. Conversely, with SiteGround, it takes just 3 clicks to kick start your new website. While SiteGround doesn’t offer a free domain name, getting started with a new website is hassle-free. Unlike Bluehost, they offer a drag and drop website builder to create a new website in no time. 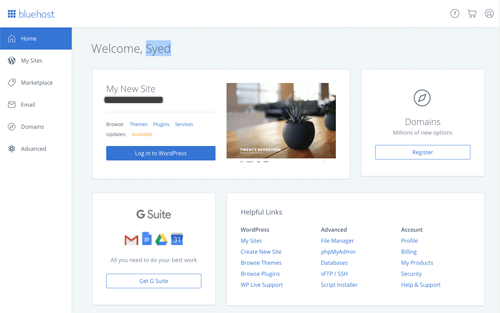 Even though SiteGround offers a website builder and 1-click installers, in terms of ease of use, we believe Bluehost excels in comparison to SiteGround because of their highly optimized onboarding experience for WordPress users. 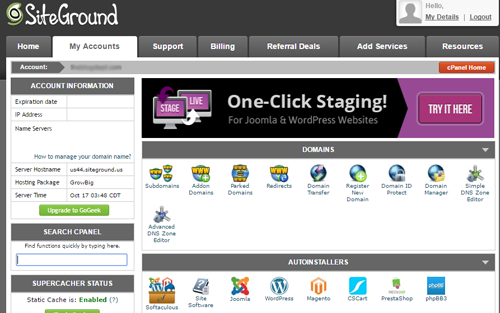 However, if you need a drag and drop builder with your web hosting plan, then you might want to consider SiteGround. Bluehost provides you with all the standard hosting features you should expect from a provider, including unmetered bandwidth, SSD storage, free SSL, 1-click installers, etc. With a slightly expensive shared web hosting plan, you’ll get unmetered SSD storage, unlimited email accounts, unlimited storage, $200 worth marketing offers, site backups, and more. Free daily backup, website builder, and CloudFlare CDN with every web hosting plan. With a slightly expensive plan, you can avail free site transfers and backup restores. You can also boost your load time with SuperCacher. If you need geeky advanced features such as PCI compliant servers and 1-click Git repo creation on your shared web hosting, you can subscribe to their GoGeek plan. Without a doubt, SiteGround crushes all their competitors, including Bluehost, thanks to their WordPress essential and advanced features. Bluehost offers 24/7 support via phone and live chat to resolve your hosting-related issues quickly. Best of all, their in-house team of WordPress experts can help you resolve any WordPress-related inquiries. That said, in an effort to focus more on providing personal and direct support through phone or chat, Bluehost has discontinued email-based ticket support. This can be frustrating to users with more advanced issues that may take a bit longer to resolve. SiteGround, on the other hand, offers 24/7 support via phone, email, and live chat. You can also count on their knowledge base, which covers every aspect of building a website from the ground up using their web hosting plans. One of the best things about Bluehost is that they offer a vast array of hosting options that are best suited for your budget and requirements. If you need an affordable hosting option, you can opt for one of their shared hosting plans. With every shared hosting plan, you get a free domain, free SSL, 1-click installers, and everything else you need to start a website. Once you outgrow the traffic allowance on shared hosting, you can easily upgrade to their VPS and dedicated server options. Compared to Bluehost, SiteGround’s hosting plans are slightly expensive. Bluehost $2.75 / mo. $6.95 / mo. $6.95 / mo. $19.99 / mo. SiteGround $3.95 /mo. $80.00 / mo. $3.95 /mo. - $269.00 / mo. Bluehost is the best choice for you if you’re starting a new website and need an affordable hosting solution. 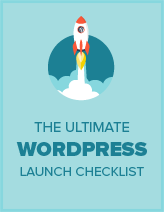 They make it extremely easy to launch a new WordPress site, even for an absolute beginner. Their vast array of hosting options is suited for every budget and hosting requirements. However, if you don’t mind spending a little more for a super fast web hosting service, then you might want to consider SiteGround. SiteGround beats the competition by providing the latest speed technologies. They also offer 24/7 support via phone, live chat, and tickets. You’d also like to check out Siteground coupon for more discount. Also, check out this comparison between Bluehost vs iPage. We hope this article helped you choose between Bluehost and SiteGround. If you’re starting a new website, then check out our step-by-step guide on how to start a website.